MASVINGO – The Federation for World Peace and Unification Zimbabwe (FFWPUZ) is set to bless more than 40 000 couples from different religious denominations nationwide at the National Sports Stadium in Harare from 19 – 21 November this year. 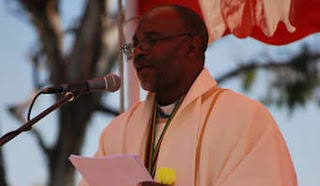 FFWPUZ chairperson, Archbishop Johannes Ndanga said that the Peace and Family Festival couples are expected to attend a marriage re-dedication holy blessing festival to be held under the motto “Strong and healthy families make a healthy and prosperous nation”. “These couples will receive a blessing prayer and thereby renew their marriage vows to make an effort to create God fearing families. Family breakdown destroys the community so as an organisation we want to encourage these couples to respect each other in their marriages thereby instiling discipline to their children leading to a better nation,” he said. The founder of FFWPUZ, Dr Hak Jah Moon, an advocate for peace and reconciliation, is set to embark on an Africa “Peace starts with me” tour and Zimbabwe will be his first port of call. The festival is intended to heal the wounds of the past and support the Government’s endeavours for peace and reconciliation. There will be celebrations with entertainment from prominent artists like Mathias Mhere and choir groups in Zimbabwe as well as a football match for peace. This event is going to attract people from all the provinces, ethnic groups, politicians, religious leaders, chiefs and the business community.